November is the month for all pensioners to provide life certificates to their bank so that they would continue to receive their pension. Pensioners can submit life certificate in physical form as well as in digital format through Jeevan Praman portal, which is based on Aadhaar. Also remember, a pension is not a largesse or bounty conferred by the state and thus cannot be denied for want of Aadhaar, as the Supreme Court has said in its 26 September 2018 judgement. This means, pensioners can use alternate for identification. While most senior citizen pensioners visit bank branches during November and sign on the register as proof of living, some find it difficult to be physically present for this. This usually means a lot of trauma for elders who are not in good health or too old to make it physically to their bank branches. The government has taken steps to end the pain of this process. However, many pensioners and their care-givers are unaware of it. Here is what you can do. The pensioner is not required to visit her pension paying bank branch in November every year for submitting life certificate. Aadhaar based authentication of life certificate can be submitted online through Jeevan Praman portal by the pensioner, which is also accepted as life certificate, in addition to existing ways of submitting life certificate in physical form. A pensioner can submit Aadhaar-based online life certificate through the Jeevan Pramaan website https://jeevanpramaan.gov.in/. A successful authentication generates digital life certificate that gets stored in the Life Certificate Repository, which can be accessed online by the pension disbursing agencies such as bank. But more about it later. An office memorandum, issued by the Central Pension Accounting Office, under the Ministry of Finance, clearly says, "...the pension account holding branches of all authorised banks may be instructed to strictly adhere to the existing norms and do not harass the pensioners/family pensioners by insisting upon presenting themselves physically in the bank if their life certificate is submitted duly signed by the authority specified in Correction Slip No.14..."
This means, pensioners who are unable to visit their bank branch, can submit a life certificate, duly signed by a Magistrate, a Registrar or sub-Registrar, a Gazetted Officer, a Police Officer no below the rank of Sub-Inspector, a postmaster, a class I officer of the Reserve Bank of India (RBI), a pensioned officer who before retirement exercised powers of a Magistrate, a Justice, a Block Development Officer or Munsif or Tehsildar or Naib Tehsildar, a Head of Village Panchayat, a Member of Parliament or State Legislature or a Treasury Officer..
For pensioners receiving pension through their savings account in a public sector bank, the Officer of the bank can sign the life certificate. However, many a times, such pensioners or their family members find it difficult to submit physical copy of the life certificate. Abhay Datar, a retired banker and expert at Moneylife Foundation’s Helpline says, “"Pensioners, who are not in a physical condition to visit the branch, can request an officer from the bank to visit their home for signing the certificate. Also such pensioners should get a similar certificate from their doctor and attach it with the life certificate while submitting to the bank branch. Also note the pensioner is required to submit such life certificate and doctor's certificate within 30 days of signing the same by designated officer and the doctor." Coming back to the Jeevan Pramaan digital life certificate, which can be obtained through Jeevan Pramaan Centres, banks, government offices or by using an application on computer, mobile (smart phone with fingerprint scanning facility) or tablet. Here the pensioner needs to bio-metrically authenticate her life certificate in real time by giving her Aadhaar number and other pension details related to her pension bank account. After successful submission of digital life certificate, the pensioner will receive an SMS giving the transaction ID on her mobile number registered with the bank and Aadhaar. 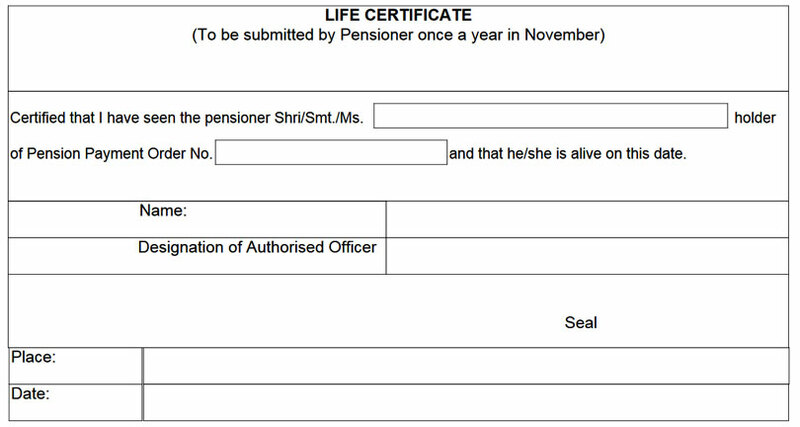 The pensioner can also download computer generated life certificate from jeevanpramaan.gov.in using this transaction ID for their records. However, remember, digital life certificate submitted by the pensioner can be authenticated only when the pensioners’ account has been seeded with her Aadhaar number. “A right cannot be denied on the anvil of requiring one and only one means of identification. The pension disbursing authority is entitled to lay down regulations (which are generally speaking, already in place) to ensure the disbursal of pension to the person who is rightfully entitled. This aim of the government can be fulfilled by other less intrusive measures. The requirement of insisting on an Aadhaar number for the payment of pensionary benefits involves a breach of the principle of proportionality. Such a requirement would clearly be contrary to the mandate of Article 14,” the apex court has said. This means, pensioner cannot be denied pension for want of Aadhaar number or digital life certificate. Physical life certificate are still valid and continue to be accepted if preferred by the pensioner.